"The devil was bound by the Lord as a sparrow, that we should mock him. And with him are placed his companions the demons, like serpents and scorpions to be trodden underfoot by us Christians." It has often been said by certain Christians that Halloween is a Satanic holiday, a day of homage to the devil. This is a regrettable notion, since Halloween in fact is the exact opposite. But how did such thinking come to be? Anton LaVey formed the Church of Satan in 1966 and published the Satanic Bible in 1969. It is important to note that this was the first organized religion to ever label itself as Satanic, and anything labelled Satanism did not exist before this date. The Church of Satan was founded as a reaction to the hypocrisy LaVey observed among Christians and it was his way of mocking Christianity by using words such as "church" and "satan", when in reality he didn't believe in the existence of God or the devil, but only himself, and thus Satanism according to LaVey is existential and the worship of the self. LaVey stipulated three holidays for his version of Satanism. The first and most important date is each Satanist's own birthday. It is, after all, a religion centered on the self, so it is understandable that this is the most significant day to a Satanist (could birthday's be Satanic too?). The other two holidays are Walpurgisnacht (April 30) and Halloween (October 31). Both dates were often considered "witch holidays" in popular culture and thus they became linked with Satanism. LaVey adopted Halloween less because of any inherent Satanic meaning in the date but more as a joke on those fundamentalist Christians who had superstitiously feared it. And contrary to some conspiracy theories, Satanists do not view Halloween as the devil's birthday. As I said, Satan is a symbolic figure in the religion. Furthermore, the Church of Satan describes October 31 as "the Fall climax" and a day to costume according to one's inner self or reflect on a recently deceased loved one. What many who consider Halloween a Satanic holiday do not realize is that Halloween is in fact a Christian holiday, dating to the early Middle Ages in the West, where it was considered the Eve of All Saints Days, or All Hallows Eve, from which the name Halloween derives. The reason it is celebrated on October 31st has nothing to do with any Satanic or Witch holiday, or even a pagan holiday at that, but it is celebrated in the West on that day because the Pope consecrated a church in Rome dedicated to All Saints on this day, and so the day stuck. That being said, when most people call Halloween a Satanic holiday, they do so because they superstitiously think any mention of the devil outside of a church building only invites evil, no matter what. But when was the last time you heard the devil being adored on Halloween? or praised? or glorified? or worshiped? Some people may do so in a symbolic way, just to be rebellious, but this is done 365 days a year. What I'm asking is what is uniquely done on Halloween that makes it particularly a Satanic holiday, unless you are a member of the Church of Satan? If you're honest with yourself and with the facts, you won't find anything uniquely Satanic being done on this day. 1. The Church of Satan honors Halloween as one of their major holidays, but they neither believe in him nor do they worship him. They are a reaction to the Church of Christ, and anything founded upon a reaction is nothing more than a flattery towards something more powerful which it is reacting to. 2. The Bible describes the devil as an angel of light. When is the last time on Halloween you saw the devil as an angel of light? Instead, what you usually see is the devil as a red-horned hideous figure holding a pitchfork. 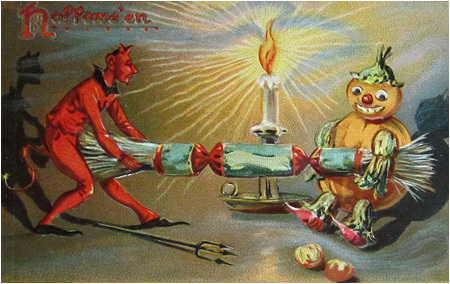 This depiction of the devil is a Christian mockery of the devil, showing him as a fallen figure and no longer an angel of light, with reminders of the fact that he is condemned to the torments of hell (which is why he is red and holding a pitchfork) and thus defeated by God. 3. Even the monsters of Halloween are a mockery of the devil. A witch is shown as a hideous old hag (to the chagrin of modern wiccans who would like to change this image) to remind us that if you want to dance with the devil you will be cursed; a vampire is a walking corpse selfishly feeding off humans to turn us away from wanting to be condemned to such a fate (historically vampires were excommunicated by the Church during their life); Frankenstein's monster is a warning of what you get if you try to play God, and so on and so forth. These monsters teach us through fear lessons on how to avoid being monsters in our own lives and even living a life of virtue. 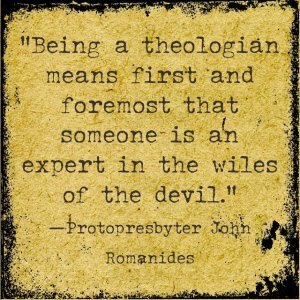 This is exactly what the devil doesn't want. The devil wants us all to become living monsters, without the appearance of monsters. 4. Lastly, Halloween is primarily a day in which communities come together and open their doors to one another. It is a time of good-will, generosity and hospitality. This is primarily the type of Halloween that society promotes to be celebrated. What is so Satanic about that? I have often said that the darkest part of Halloween is when a trick or treater comes to a house with its gates closed and its lights turned off. Darkness is where the devil resides. God dwells in light. Remember that the next time you want to shut your lights off on Halloween.